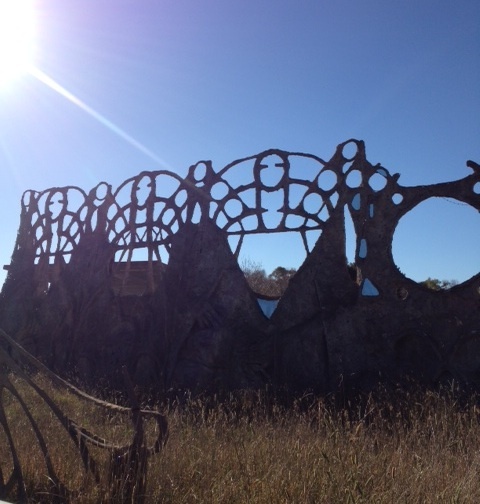 Yesterday, on my first ever trip to Collector, NSW, I saw Dreamer’s Gate. There are many mentions online about this eerie construction, asserting itself in the landscape, standing stark in the dusty golden light and in full view of the local pub, but I hadn’t read any of it. I was taken aback by the scale and intricacy, heartbroken by its loneliness and the bizarre folly of it all. My mind raced, thinking of people everywhere, doing things for reasons they can’t explain, working with passion to useless ends. I thought – this is what real art feels like. It does not seek permission, it does not ask to be loved, it does not strive to be beautiful, or clean or neat. It is not made quickly, or to direction. It is not normal, or safe. It does not even make sense. It is an idea that grows so slowly no-one can pin-point where it came from. And as the slow growing goes it will never be complete. It is hard. It is difficult. It is thankless. It will send you broke and into debt. And none of that will matter because it’s just something that you do, sure as blinking and breathing, while everywhere people tell you no and ask you why. It is, among many things, an unfinished testament to your father built of chicken wire and cement in a vacant lot of a tiny country town. Ah Tony Phantastes, thanks for reminding me about art. I need that more often than ever, these days. I hope they don’t tear down your sculpture. …apparently Tony studied sculpture at the ANU School of Art. Does anybody remember him / know what he does now? Wow looks incredible. I have never even heard of this being at Collector. Were you there for the pumpkin festival? Nice. Have lived in Canberra for 5 years and have shamefully never made the trek to the Collector pumpkin fest. Dude had big hands, shifted up to the midnorthcoast. Was/is? a sister/ younger brother to this wall in Ainslie. He spent more time shuffling paper about this things existence than mixing the mud. Yea I gather. Have learnt lots more about the Ainslie stuff thanks to helpful folk – hoping to write more about it in the future! Thank you. This is an excellent viewpoint. Tony P has been trying to get enough money to pay the horrific court costs and then wants to try to save the sculpture before it collapses. Presently it’s unfinished and deteriorating fom the back. He was last seen working on the NSW north coast, but has the land still in Collector. Is there some way we can help save this important feature of art in Collector, NSW..? The awful fight over the sculpture has been an horrific indictment of the people of Collector and to a degree the “politically correct” conformity of bureaucratic Canberra whose residents have done insufficient to fight against the myopic group in Collector and Gunning who so terribly sought to destroy one of the pitiful few points of interest in Collector. A “me-too” American imitation plastic “pumpkin festival” is absolutely NO substitute for this unique artwork that has been the creation of the artist on his own land at his own expense. Worse, because of the petty-minded narrow views of the locals who complained to the equally small-minded Gunning Council, the artist has to find more than $30,000 to pay the destructive council’s legal costs and cannot complete the sculpture because he no longer has the money. So the abysmal, culturally dead Gunning Council and the artistically dead, “chattering cass vocal and tiny-minded minority” Collector residents who objected to the sculpture because “it might interfere with their view from the pub verandah” look like winning anyway. And Collector will lose another of the very few reasons why anyone might bother to stop by more than once. Won’t someone help give the sculptor a chance to complete a most interesting, and now heritage aspirant work of art for all to enjoy…? And for the enrichment of the “silent majority” who want some form of interest, uniqueness, life in Collector…? Is what has happened to Tony’s epic, heritage nominated, and seriously threatened sculpture in Collector yet another example of the increasing incidence of Rightist social political correctness censorship and the subsequent attack on freedom of speech in C21st Australia…?